Another day. Another 10-run outburst. Another young starter taking a step forward. Another strong bullpen performance. The elephant in the room is that the Braves are employing a replacement level 3B at the moment. He made a crucial error that lead to a 3-run double and the end of the night for Soroka. Otherwise, Soroka pitched pretty well. No walks, threw about 65% strikes, but couldn’t get through the fifth largely due to the error. The bullpen went Moylan->Carle->Minter->Winkler->Vizzy. It’s happened enough that it seems that Winkler has passed Minter in bullpen hierarchy. We’re 6-deep in the pen right now, 7 if you count the usually effective long man, and you can make the argument that Moylan is now our least effective reliever. The bullpen’s ability to keep us in games has been one of the biggest reasons this team sits 23-15. Freddie Freeman hit 2 home runs. Ender Inciarte hit one as well. Ronald Acuna is in a little bit of a slump, and Nick Markakis had his 4th-straight night of two hits. But now I’d like to talk to you about our AA production. You remember yesterday that we covered how well Austin Riley had been doing at AA before his promotion, but there’s still plenty, and perhaps more, to talk about at AA. The bad news is that Kyle Wright has had a little bit of a slow start. He’s getting hit a little hard (32 H in 31 IP) and walking almost a batter every two innings, but his K rate is strong (34 K in those 31 IP), and he’s kept the ball in the ballpark (1 HR). He’s only had 16 professional starts, moving through 3 levels in the process, so some patience is important. He fired 7 scoreless innings last night, though, so he may be conquering AA. We shall see. The rest of the pitching has been impressive. For the sake of time, I’ll merely mention that their relief pitching has been very impressive with Adam McCreery, Jacob Webb, and Devan Watts all emerging as interesting relief prospects not particularly far from the bigs. Touki Toussaint has been a welcome surprise as he’s put together a string of 7 starts where he’s looked like the electric talent he was projected to be. Big stat: 48 K in 36.2 IP. If he can continue his rapid progress, he’ll be in AAA soon. Wes Parsons, a “top” prospect before the rebuild pushed his name down the line, has put together a strong run of starts with a 1.23 ERA in 29.1 IP. Injuries had held him back, but he appears healthy. 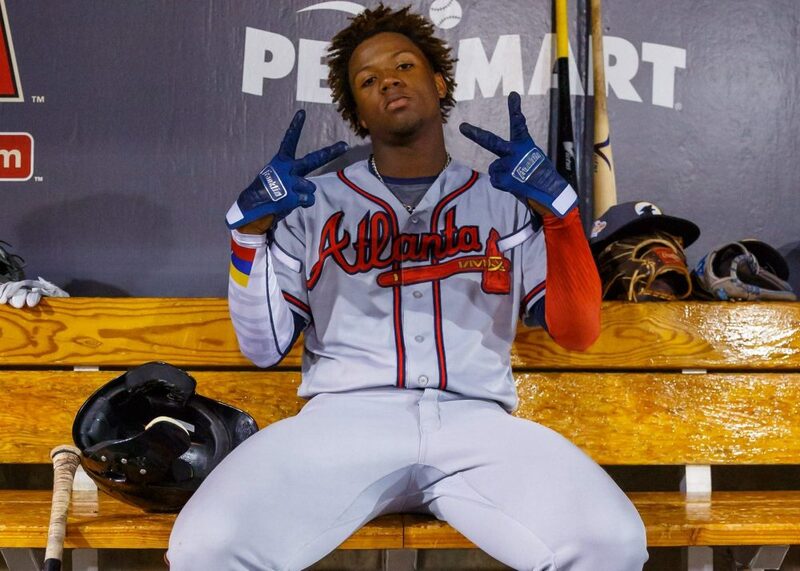 He’s 25 now, so he may struggle to get into a window in Atlanta’s plans, but they did promote him to AAA last night, so he’s move up to the highest level. Good for him. The position players have struggled. Pearl, MS is not the most hitter-friendly environment. Other than Riley, our only other top hitting prospect is Alex Jackson, and he is sporting a sub-.200 BA and a sub-.600 OPS. He had 120 PAs in AA last year to a better result (.744 OPS), so hopefully this is just a slump. This is my last thing on Allard. He’s 20 years old in AAA. I count 14 pitchers in our top 30 prospects I’d rather bundle up and trade than him at this juncture. Because some think he’d be the “second- or third-best prospect in a trade”, then I think you just don’t trade him. Untouchable? No, of course not. If he’s the top player you deal in a 3-1 trade for an elite player, then yes, trade him tomorrow. But he seems to be very low down the rung of players I’d be willing to make the second- or third-best player in a deal. Sue me. I believe I read that Pearl’s park depresses HR the most in all of miLB. I just looked up Soroka’s updated stats. Best xFIP among the starters by nearly half a run. BABIP against more or less highest on the team (over .400). I hope someone is telling this kid how good he’s actually pitching and that he is running with about the most rotten luck in the majors right now (and some less than stellar defense too). I couldn’t understand how he kept getting two quick outs inning after inning and not being able to get the third. With regards to Minter and Winkler, I think the juxtaposition makes sense. Even Fangraphs is talking about Winkler as our unsung hero. I’m not sure what it is with Minter. Most of his ball calls are very close to strikes – like an inch off the plate – and he is keeping the ball very low in the zone. I don’t know if he’s just missing the target or if the target is a little off or what. I think he might need to challenge hitters up in the zone occasionally; they might swing more at the low stuff if they get some high strikes to go with it. Whatever needs to change with Minter, it’s going to be a very slight adjustment. What’s happening to him this year is different from any other level he’s been at including last year in the majors. Thanks for the farm report, Rob. Haven’t been able to keep close track lately. Good to hear Touki’s been continuing his success. He and Riley are my faves I’m watching this year. BABIP is one of those stats that shouldn’t be a stat. It’s meaningless without the context of hard/soft contact rates. MLB Network Radio guys had a Moustakas and Herrera for Gohara and Jackson trade proposal, so I know Roger will like that. They felt like adding Moustakas and Herrera turns us into legit World Series contenders. Adam would be crushed. You gotta love how fast Newk is working. I’m not worried about Minter. The stuff plays, and he’ll make whatever adjustment he needs to. When he starts mowing down hitters consistently, I could see him having that imposing demeanor that just makes his inning all the more entertaining. And Winkler has just been that good. He’s been worth the wait. 12 pitches, 9 strikes. Newcomb looks on today. @6 I’d make that trade so fast that Dayton Moore’s head would spin. @6, YOU’LL ALL BE SORRY. I was about to rave about Newcomb’s command in the first two innings. Now he walks two in the third. Is a Newk episode about to happen? No–he regained control. I’m really liking the new Newk. His curveball isn’t working today. Luckily it’s only the Marlins. Riley has 2 homers today and Allard has tossed 6 shutout innings. Urena and Newk have totally reversed themselves. Looked like Urena couldn’t find a strike early and now Newk can’t. Pitch counts and strikes have basically evened out after five. Allard: 7 IP, 2 H, 1 BB, 7 K, 89 pitches so far. Make it 7 shutout innings for Allard. 2 hits, 1 walk, 7 K.
I’ve been skeptical of the speculation that has Riley being called up by the ASB; I’ve been assuming he’s a September call up. I’m starting to change my kind–he may be pretty close to ready. As to Allard, I’m not joining that debate. But the results so far are pretty remarkable, aren’t they? Inciarte is now being used as if he were a leadoff hitter for the 2nd half of the order. Somebody different every night. Love it. The lineup has a first team and second team. Ender is second team lead-off. He has a shot at making first string if he keeps up. Albies is in a skid and his OBP isn’t that good, so that’s quite possible. @6 I guess the best trades either make both sides happy or both sides uncomfortable. I think that’s too high a price for a couple of rentals, although I bet it’s in the ballpark of what might be required. Trading for either one, individually, would likely require two decent but lower level prospects. I had proposed four lower level prospects along with some current 40-man folks for money/roster balance. I don’t think the Braves will add any payroll this year at all. Also, the way Gohara and Jackson are currently performing, we could be selling low on them if we make the trade suggested. Don’t we think Gohara is too close to the majors, having used two options already to include if the Royals are going to do a major rebuild? Wouldn’t the Wentz/Muller/Anderson variety be better to include (I’d prefer the Jaseel, Tarnok, Weigel, Sanchez type)? Unless someone is planning on trading for Realmuto (who’s certainly hitting well against us), isn’t Jackson the great hope for catcher? I would rather see some lower level types at positions that may already be secure be traded (e.g OF like Izzy or Cumberland for a C/OF/1B type). Too high a price for a dude that hit 40 HRs and another thats been a MLB closer for 10 years for a fat guy without many pitches and a guy that cant catch and now has struggled to hit? Some of you need psychiatric treatment for your prospect hoarding addictions. How about rotating the #1, #2, #6 slots between the three? Make the hottest hitters #1, #2 and the slumper at #6 until he recovers. With the exception of Ender’s [normal] lack of power, all three have similar tools – hit and speed – and they don’t strike out much. Kolby gets another strike out and completes the 8th. 8 IP, 8 K, 2 H, 1 BB. 105 pitches. @26 – And Riley has his first two AAA homers in that game. @24 Chief, you are the poster child for selling low. The fat dude throws 100mph with control and the guy that can’t catch is learning quickly the position and hit a ton until recently (check those AFL stats along with last year’s AA stats). I could swear on the last thread @83 indicated Gohara was the third best LH pitching prospect in all of the major leagues. What kind of dope have you been smoking? The Braves have done exceptionally well calling others off and not running into each other in the outfield. I don’t know if Inciarte’s doing a good job of leading the fly ball effort or if it is good preparation and coaching. Whatever the case, it’s seems to be much better than in previous years. Look, one thing that nobody is debating: Allard may be good! I don’t think the possibility that he’ll be a productive major leaguer is up for debate. My contention is: it’s time to look to trade possible for certain. Chances to win are rare. The closer we get to Memorial Day, the clearer it becomes that we can compete — and even if it doesn’t work out for us this year, next year looks all the more promising. To get the type of production that you can take to the bank, you’ve got to give up something good. That’s all. Riley has hit his third homerun of the game, a grand slam. AA doesn’t seem very high on Gohara. He came out of nowhere and put it all together last year. If he were having a tough time this season, nobody could fault him after what he’s been through. But I take the way AA has used him (and talked about him) to mean that Gohara isn’t likely to keep his gains from 2017, whatever the reasons. @28, I’m willing to bet that Gohara is a bust. @30. Last paragraph. Emphatic co-sign. @32 That’s a pretty wild set of assumptions based upon the fact you listed Gohara as the 3rd best LH pitching prospect in all of baseball. Considering what he’s been through and the fact he is the only Brazilian in the league (can you speak Portuguese? ), I think AA and everyone else rational will give him a little bit of slack. I think what AA has done so far indicates that, whatever his current performance level, he thinks Gohara will recover and be exactly who he was before. Why else would they go ahead and call him back up? And now Riley hit a grand slam. He has 3 HR and 8 RBI. Why else would they go ahead and call him back up? Our bullpen needed a long man, and Gohara’s the best guy for the job. He’s up right now at the expense of his continued development as a starter. He was our fifth starter two months ago. Soroka has leapfrogged him. What does that tell you? DeGrom threw 45 pitches in the first (0R). Out of the game after that. Is he injured again or hopefully just on a pitch limit? @30–and I concede that he may not turn out to be a good major league pitcher! That’s your point, isn’t it–it’s all possibility with him, and at some point (sooner rather than later) you need to trade some possible for some proven major leaguers. I agree completely. What’s striking about Allard is how consistently effective he’s been at every level, while being the youngest pitcher or close to it in every league. That may or may not translate into success at the big league level. Making that prediction is what they pay AA for. It’s a tough call. I’m really not a fan of trying to steal 3rd. Seems like we are making a lot of outs there. As much as one start can help Allard’s case, today’s start helped. I can’t speak to the quality of the offense he was facing, but he didn’t just have a middling performance with good results today. Maybe like Albies, Allard is a total freak of nature. But how many times can lightning strike the same team? Hmm, maybe Biddle deserved more of a chance. Making Ender look bad for getting thrown out. Thank goodness for that run in the ninth. Remember when we were discussing trading for Herrera? 5 H in the last 20 IP. I’m just not processing how you could dismiss Allard-as-ace when he’s 20 years old with a 1.85 ERA in AAA. You just have to love velocity to write off his ceiling like that. If we sit here a month and a half from now, and he’s pitching as well as he is and he has 3 quality pitches, then I’m not sure what the rub is going to be. And that’s a big point since I think it’s possible for someone to have 7-8 really good starts, but if he gets up into 15 really good starts in a row, I think that changes things quite a bit. Maybe the reason you’re having trouble processing it is that nobody dismissed anything. ERA is not a helpful stat. If you have a 20-year old who is believed to be a future staff ace and they’re very close to the big leagues, you wouldn’t label that person in the family of “untouchable”? You would have to be dismissing him as a future ace then. ERA is not helpful? Not definitive, sure, but not helpful? Who — besides people on here — believe Allard is going to be a future staff ace? Like, slam dunk, this guy is Kershaw or Strasburg, we’ve known all along, it’s going to happen. and they’re very close to the big leagues, you wouldn’t label that person in the family of “untouchable”? You would have to be dismissing him as a future ace then. Rob, we don’t know the future. Can you concede that there are good reasons to doubt that Kolby Allard is going to be “a future staff ace”? If the opportunity presents itself, I would like to trade Allard for a starting pitcher who gives us more certainty. Does that not strongly imply that I think highly of Allard’s potential? Maybe he is going to be a very successful pitcher! I would rather have a starter that I can be sure of. Qualities that correlate well with certainty in a frontline major league starter: velocity, lots of strikeouts, few walks, great stuff, durability…this isn’t rocket science. Not helpful. You have much better statistics you can use, and you know that you’re using a tiny sample of ERA misleadingly. Again, Fangraphs put a 50 on Allard. Same as Max Fried, who they included in their top 100, unlike Allard. Is Fried a future staff ace too? Is every 50 on their list a future staff ace? To be fair, scouts’ future value rankings aren’t gospel either. There’s always hits and misses. If Allard keeps mowing down AAA lineups then he’s going to be here soon enough. I think we still need a surplus of pitching, given that we don’t quite know what we have at the MLB level still. I think the best way forward will be to add a guy that just costs money (ala Maddux back in the day). @60. It’s why I will believe that the Braves are players when they sign a marquee FA. FA is the only way that you can improve your team TO THE DETRIMENT OF YOUR COMPETITION. Trades often weaken one team, or are neutral… and the MLB Draft is the ultimate crap shoot.